21. prApthi palamAy varumathiRE kainkaryam. 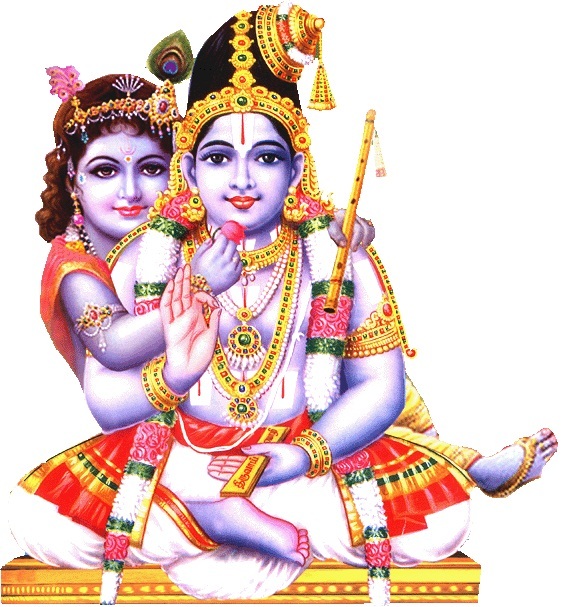 jIvAthmA, by nature, is a servitor of the supreme lord srIman nArAyaNan. Only if he serves bhagavAn/bhAgavathas he will have his svarUpam satisfied. Such kainkaryam (service) is the result of reaching bhagavAn. 22. sEshikku udhdhEsyamAnathu sEshabhUthanukku udhdhEsyamAych chollavENumO. சேஷிக்கு உத்தேச்யமானது சேஷபூதனுக்கு உத்தேச்யமாய்ச் சொல்லவேணுமோ. Whatever is dear to bhagavAn who is the lord, it automatically becomes dear to jIvAthmA who is the servant of bhagavAn. 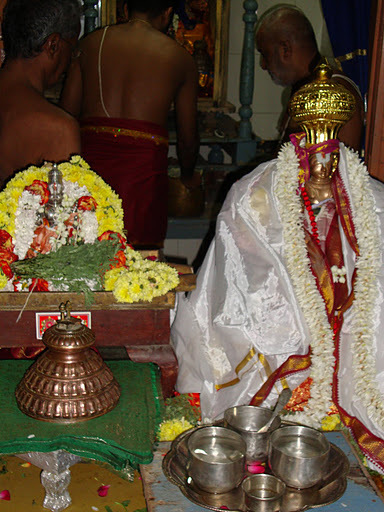 23. karaNangaLukkuk kidaiththa kAryangaL koLLavE svarUpavirOdhiyAy vandhERiyAnavai thannadaiyEpOm. கரணங்களுக்குக் கிடைத்த கார்யங்கள் கொள்ளவே ஸ்வரூபவிரோதியாய் வந்தேறியானவை தன்னடையேபோம். My mouth will only glorify bhagavAn. My hands will only worship the one who measured the whole world as thrivikraman. 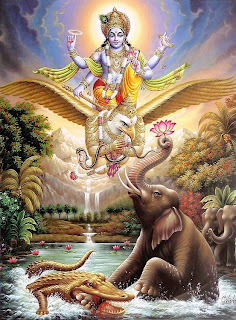 My eyes will not see anything but the divine form of kaNNan emperumAn who consumed the poison from the breast of evil-minded pUthanA and my ears will not hear anything other than his names. By engaging the senses in bhagavath vishayam, the hurdles that stop the progress of jIvAthmA will automatically be removed. 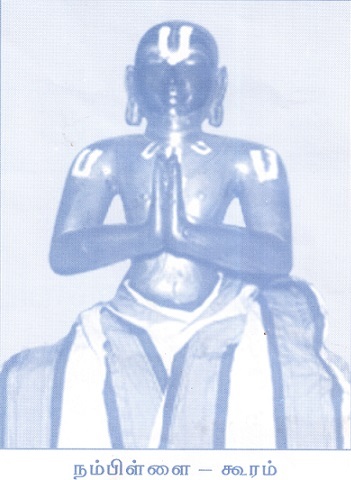 24. guNangaLukku piriththu sthithiyAthal, upalambamAthal illAthAp pOlE vibhUthikkum avanaiyozhiya sthithiyAthal upalambamAthalillai. குணங்களுக்கு பிரித்து ஸ்திதியாதல், உபலம்பமாதல் இல்லாதாப் போலே விபூதிக்கும் அவனையொழிய ஸ்திதியாதல் உபலம்பமாதலில்லை. sthithi - existence, upalambam - observability. An attribute can neither exist nor can be observed without the substance. For example, in red cloth - the redness and the cloth are inseparable - so redness can neither exist without that cloth nor can it be observed separately. Similarly, bhagavAn's wealth (nithya vibhUthi - spiritual world, leelA vibhUthi - material world) can neither exist nor can be observed without bhagavAn. 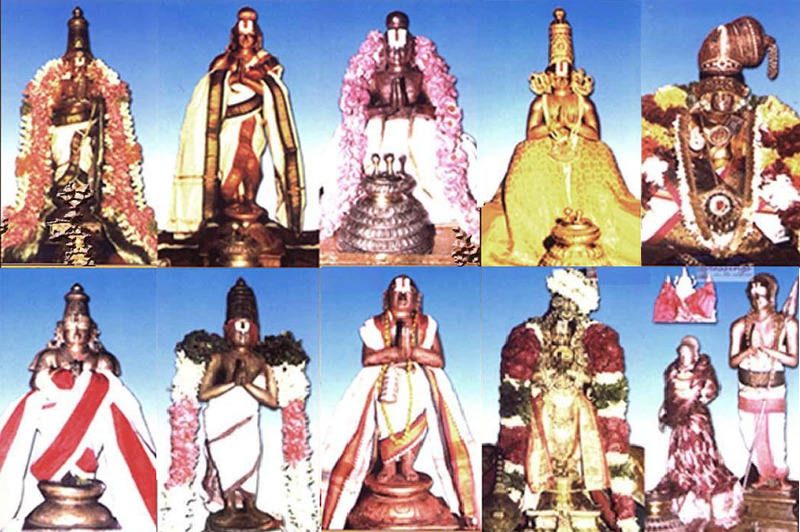 25. karma nibanthanamAna AkAram smruthi vishayamAgAthapadiyAna pAkam piRanthAl thadhIyamAyE thORRi ellAmokka anubhAvyamAyirukkum. கர்ம நிபந்தநமான ஆகாரம் ஸ்ம்ருதி விஷயமாகாதபடியான பாகம் பிறந்தால் ததீயமாயே தோற்றி எல்லாமொக்க அநுபாவ்யமாயிருக்கும். Once we fully realize that bodily comforts/distresses are due to our own puNyam/pApam only, we will understand that every thing is owned by sarvEsvaran and naturally acceptable. Translator's note: This principle is explained beautifully by piLLai lOkAchAryar in thathva thrayam 74, 75, 76 sUthrams which we can understand through the beautiful commentary of maNavALa mAmunigaL. 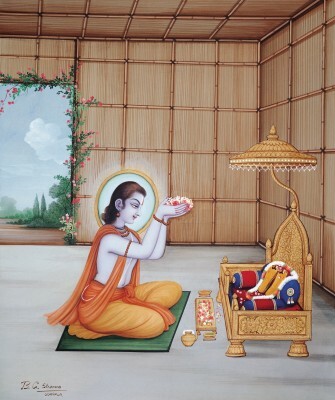 He explains that since everything is owned by bhagavAn, everything is favourable only. It is only due to our bodily conception we consider some as favourable and others as unfavourable. For example, due to the bodily conception, if one person feels hot in one place during summer, the same person feels cold in the same place during winter. But if we go beyond the bodily conception - one will understand the true nature of jIvAthmA, accept whatever situation one is placed in and will work positively with a favourable attitude towards bhagavAn in all such situations. 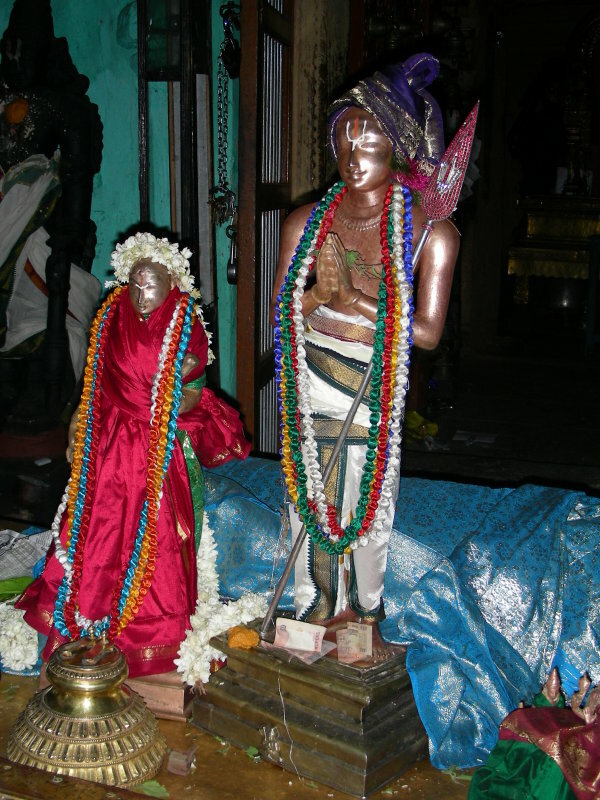 26. vaishNava santhAnaththilE piRanthArkku Isvara marmangaL theriyumiRE. வைஷ்ணவ ஸந்தாநத்திலே பிறந்தார்க்கு ஈஸ்வர மர்மங்கள் தெரியுமிறே. 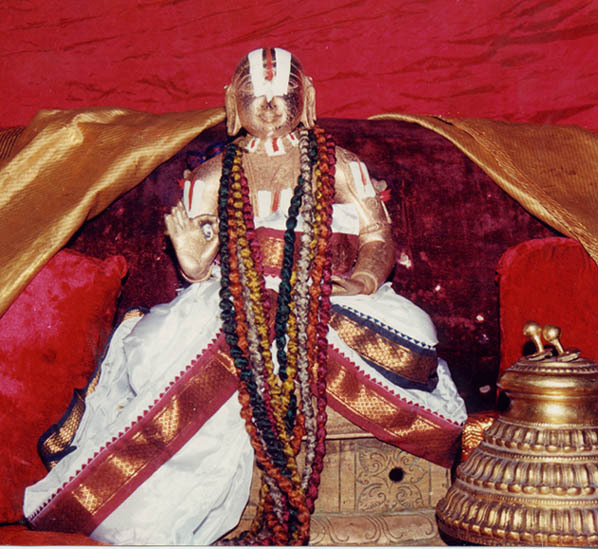 One who is born in vaishNava family, will know the intricacies/confidential matters of bhagavAn. For example, ANdAL who was the daughter of periyAzhwAr was fully aware of the divine qualities/intricacies of bhagavAn. 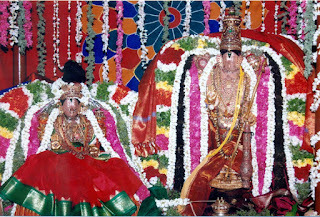 27. manushya janmaththukku palam bhagavath samAsrayaNamAy irukka, athu illAthAr manushyar allar. மனுஷ்ய ஜந்மத்துக்கு பலம் பகவத் ஸமாஸ்ரயணமாய் இருக்க, அது இல்லாதார் மனுஷ்யர் அல்லர். 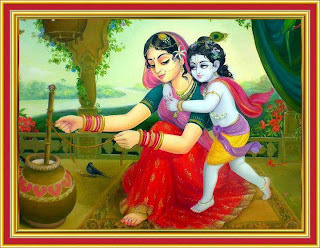 The purpose of human birth is to approach bhagavAn and accept his refuge. If that was not done, those people will not even be considered as humans. It is essential for the jIvAthmA to atleast abstain from unfavourable acts towards bhagavAn. Translator's note: piLLai lOkAchAryar explains this beautifully in mumukshuppadi 203rd sUthram through rAmAyaNa slOkam "cha chAla chApam cha mumOcha vIra". 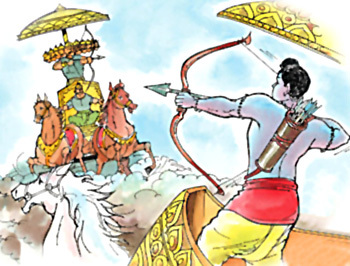 When rAvaNan was holding on to the bow and shooting arrows at srI rAma, srI rAma was counter-attacking as well - but when rAvANa's bow was broken by srI rAma and he dropped it down, srI rAma immediately stopped attacking rAvaNa and gave him a life-line.This principle is explained in context of all other upAyams (other than bhagavAn himself) which stop bhagavAn from uplifting us. 29. oru chiRAyai visvasiththu ARu mAsaththukku vENum chORum thaNNIrum ERRikkoNdu kadalilizhiyA ninRAn. 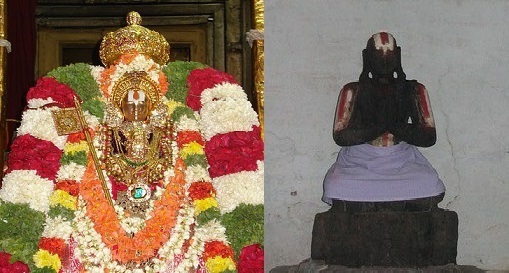 avvOpAthi visvAsamAgilum vENdavO bhagavath vishayaththaip paRRuvArkku. ஒரு சிறாயை விச்வஸித்து ஆறு மாஸத்துக்கு வேணும் சோறும் தண்ணீரும் ஏற்றிக்கொண்டு கடலிலிழியா நின்றான். அவ்வோபாதி விச்வாஸமாகிலும் வேண்டவோ பகவத் விஷயத்தைப் பற்றுவார்க்கு. chiRAy - small boat. People have faith on a boat and board it with food and water that are required for six months and venture into the ocean. Should we not have atleast the same faith in taking shelter of bhagavAn? 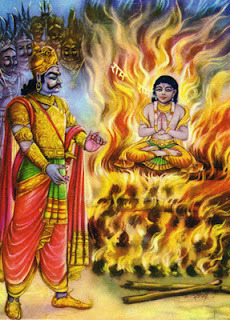 In today's world, we have faith in so many aspects like doctors, travel on vehicles (on the road, water and air), job, bank balance, properties, etc - if only we (who have surrendered to bhagavAn through an AchAryan) had similar faith towards bhagavAn we will have total commitment towards him and give up on these totally material aspirations. 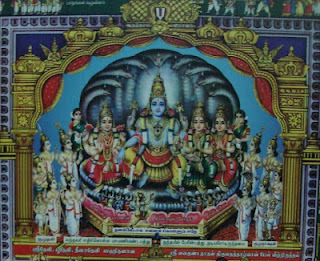 30. prApyaththil prathamAvathi bhagavachchEshathvaththaLavilE niRkai; charamAvathi bhAgavatha sEshathvaththaLavilE varugai. ப்ராப்யத்தில் ப்ரதமாவதி பகவச்சேஷத்வத்தளவிலே நிற்கை; சரமாவதி பாகவத சேஷத்வத்தளவிலே வருகை. With respect to the achievable goal - the first level is to stay as a servitor of bhagavAn; the ultimate level is to become a servitor of bhAgavathas. Translator's note: For more details on this 30th vAkyam, please read http://ponnadi.blogspot.in/p/anthimopaya-nishtai.html. 11. prApyAbhAsangaLilu prApagAbhAsangaLilum negizhnthu avanaiyozhintha ellAvARRAlum oru prayOanaminRikkE irukka vENum. ப்ராப்யாபாஸங்களிலு ப்ராபகாபாஸங்களிலும் நெகிழ்ந்து அவனையொழிந்த எல்லாவாற்றாலும் ஒரு ப்ரயோநமின்றிக்கே இருக்க வேணும். Any other goal than bhagavAn is simply not truly achievable goal. Any other means than bhagavAn is simply not a true path. One should clearly remove these misconceptions from the mind and be fully faithful that there is nothing other than bhagavAn to be achieved. That is the best situation to be for a jIvAthmA. 12. paramasEshiyaik kaNdAr dhvArasEshigaL aLavil nillArgaLiRE. பரமசேஷியைக் கண்டார் த்வாரசேஷிகள் அளவில் நில்லார்களிறே. emperumAn who does not have any one equal or higher to him is the true master for every one. 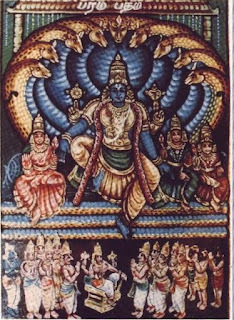 Other dhEvathas such brahmA, rudhran, etc., are called dhvAra sEshis - meaning they are empowered by antharyAmi emperumAn (srIman nArAyaNan) to be master of certain tasks (like creation, annihilation, etc). bhagavAn blesses the ones who surrender unto him directly. For the ones who surrender to other dhEvathas, he blesses them indirectly through the dhEvathas (by being the antharyAmi of those dhEvathas). Thus, the ones who have truly understand the nature of bhagavAn, will not approach other dhEvathas such as brahmA, rudhran, etc. 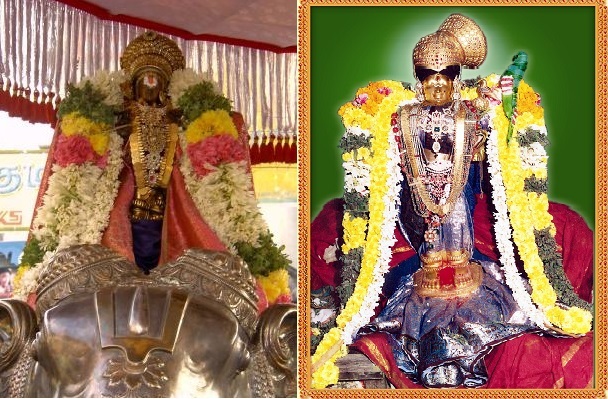 13. avan thAnE kAtta AzhwArgaL kaNdAppOlE kANbArkkuk kANalAmiththanai allathu svayathnaththAl kANbArkku aRiyappOmO. அவன் தானே காட்ட ஆழ்வார்கள் கண்டாப்போலே காண்பார்க்குக் காணலாமித்தனை அல்லது ஸ்வயத்னத்தால் காண்பார்க்கு அறியப்போமோ. emperumAn revealed his true nature, forms, auspicious qualities, wealth (nithya/leelA vibhUthis), etc to AzhwArs out of his nirhEthuka krupai (causeless mercy) and thus they saw him. Unless emperumAn reveals these mercifully by himself, it is impossible difficult to understand him through ones own efforts. 14. AsrayaNIyan avanE! brahmarudhrAdhigaL AsrayaNIyar allar. ஆச்ரயணீயன் அவனே! 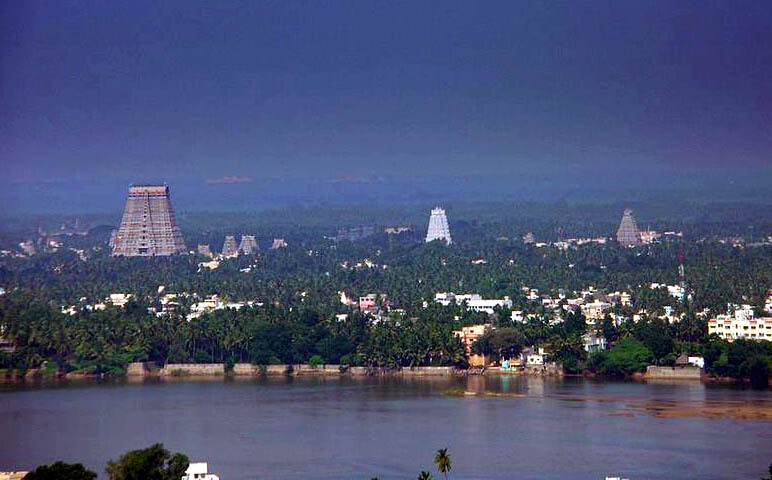 ப்ரஹ்மருத்ராதிகள் ஆச்ரயணீயர் அல்லர். srIman nArAyaNan is the only refuge for every one. brahmA, rudhran, etc are not the refuge. 15. muktharum nithyarum thAngaLum anubaviththu avanaiyum AnandhippippargaL. bhadhdhar thAngaL AnandhiyAdhE avanai AnandhippippargaL. முக்தரும் நித்யரும் தாங்களும் அநுபவித்து அவனையும் ஆநந்திப்பிப்பர்கள். பத்தர் தாங்கள் ஆநந்தியாதே அவனை ஆநந்திப்பிப்பர்கள். mukthas (liberated jIvAthmAs) and nithyas (eternally free jIvAthmAs) enjoy themselves and bring great joy to srIman nArAyaNan. bhadhdhas (conditioned jIvAthmAs in samsAram) suffer (due to ignorance in bhagavath vishayam) and bring joy to srIman nArAyaNan by becoming part of his leelai. 16. sarvEsvaran thrividha chEthanaraiyum svarUpAnurUpamAga adimai koLLA ninRAn. ஸர்வேச்வரன் த்ரிவித சேதநரையும் ஸ்வரூபாநுரூபமாக அடிமை கொள்ளா நின்றான். 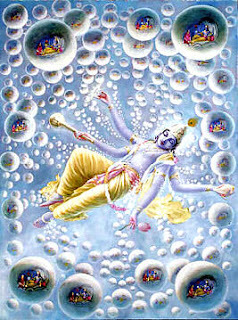 The supreme lord accepts service from all 3 types of chEthanas/jIvAthmAs according to their nature. mukthas - liberated, nithyas - eternally free, bhadhdhas - conditioned souls. 17. virOdhiyaip pOkki ujjIvippikkaiyiRE avathArangaLukku prayOjanam. விரோதியைப் போக்கி உஜ்ஜீவிப்பிக்கையிறே அவதாரங்களுக்கு ப்ரயோஜநம். The purpose/objective of bhagavAn's incarnations is to destroy the evil forces who are opposed to his devotees and to uplift his devotees. Translator's note: The same principle is identified by piLLai lOkAchAryar in srIvachana bhUshaNa dhivya sAsthram - bhagavAn's avathArams and his great activities during such avathArams are due to the offenses that were done against bhAgavathas. 18. karma samsrushtarAna chEthanarkku karma sambandhamaRRu anubavikkaikku mun thirumEniyilE nenjai vaikkap pOgAthirE. கர்ம ஸம்ஸ்ருஷ்டரான சேதனர்க்கு கர்ம ஸம்பந்தமற்று அநுபவிக்கைக்கு முன் திருமேனியிலே நெஞ்சை வைக்கப் போகாதிரே. samsAris (conditioned souls) are bound by their karmA. bhagavAn's divine forms are most beautiful and have the ability to remove all sorrows of the ones who see them. 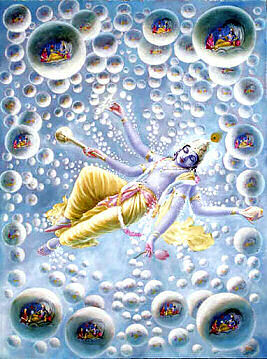 But until ones karmA is nullified, one will not be able to fully engage ones mind into the divine forms of bhagavAn. 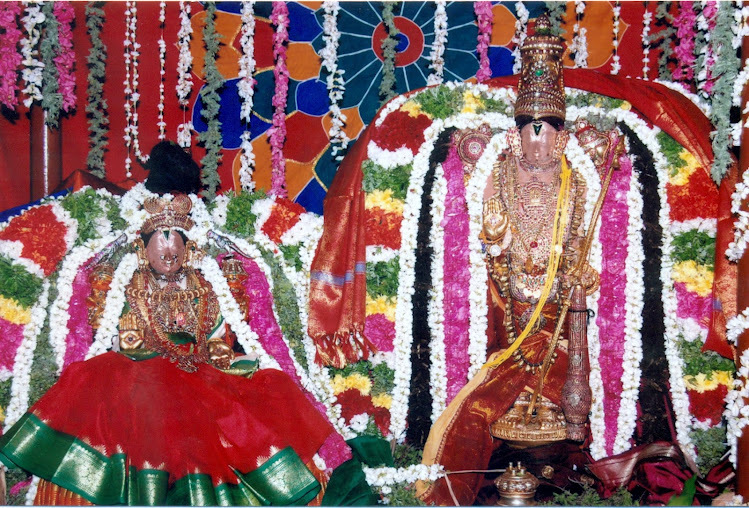 19. sEshavasthuvukku sEshathvam nirupakamAnAl nirUpakaththaiyozhiya nirUpya sidhdhi illai. சேஷவஸ்துவுக்கு சேஷத்வம் நிருபகமானால் நிரூபகத்தையொழிய நிரூப்ய ஸித்தி இல்லை. The jIvAthmA's natural subservience to emperumAn is determined by his actions of service towards emperumAn, His nature is determined through his service. So, the ones who dont serve emperumAn does not qualify to be a chEthanan/jIvAthmA (soul) - i.e., he will be considered as achit (insentient - without knowledge) only. 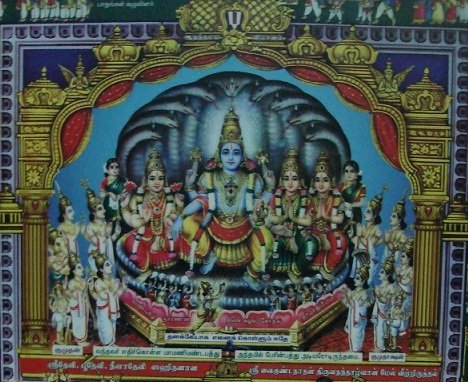 20. pArathanthriya rasam aRivArkku svAthanthriyam anarththam. பாரதந்த்ரிய ரஸம் அறிவார்க்கு ஸ்வாதந்த்ரியம் அநர்த்தம். pArathanthriyam - to be at the complete disposal of bhagavAn. For the ones who have tasted and understood being dependent on bhagavAn and being fully at his disposal, the thought that "I am independent" is very fearful. 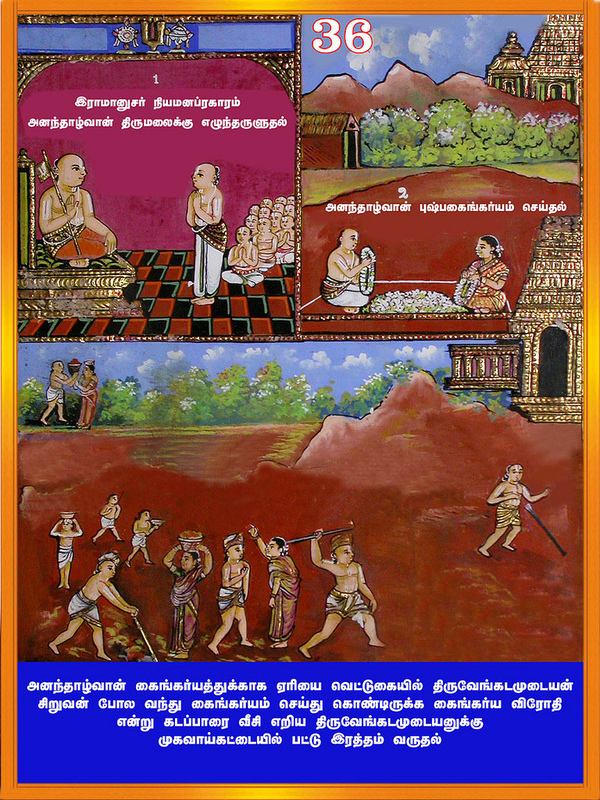 1. svapakshaththai sthApikkavE parapaksham nirasththamAmirE. neRcheyyap puRREyumAppOlE. 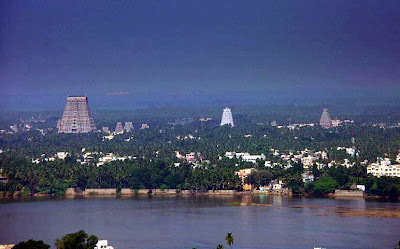 ஸ்வபக்ஷத்தை ஸ்தாபிக்கவே பரபக்ஷம் நிரஸ்தமாமிரே. நெற்செய்யப் புற்றேயுமாப்போலே. If ones own philosophy is established, other's philosophy is automatically refuted. Just like when the paddy is raised and beaten properly, the weeds will automatically be destroyed. 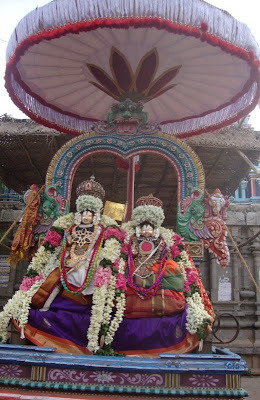 2. svarUpAnusandhAnaththukku IdAyirukkiRa thirumanthiraththinudaiya arththAnusandhAnam mOkshasAdhanam. ஸ்வரூபாநுஸந்தாநத்துக்கு ஈடாயிருக்கிற திருமந்திரத்தினுடைய அர்த்தாநுஸந்தாநம் மோக்ஷஸாதநம். thirumanthram reveals the true nature of jIvAthmA, i.e., "I (jIvAthmA), who is subservient only to srIman nArAyaNan, should give up any self-interest and accept him as the total refuge. 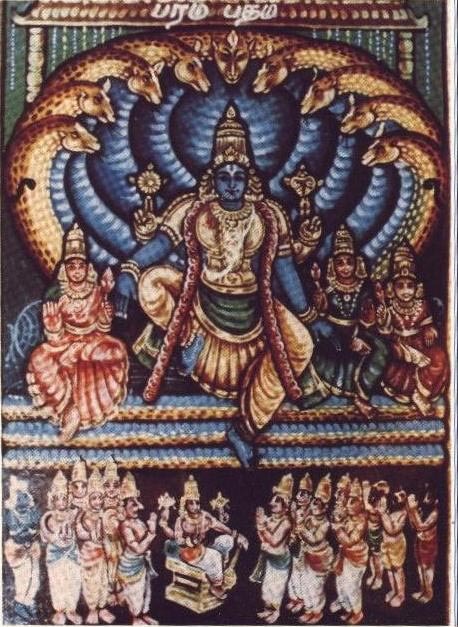 I should serve srIman nArAyaNan (who is the master of everyone) in all possible ways" (gist of piLLai lOkAchAryar's mumukshuppadi sUthram 115 summarizing thirumanthram). 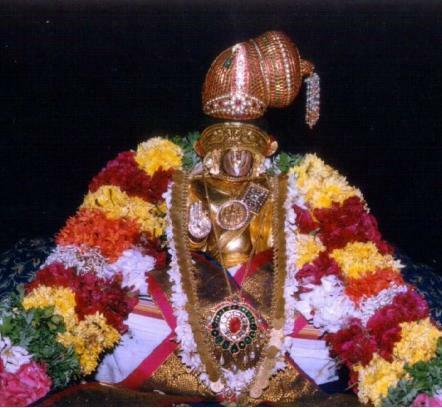 By constantly remembering the meanings of thirumanthram, one becomes truly situated in the knowledge of self and becomes eligible for salvation. 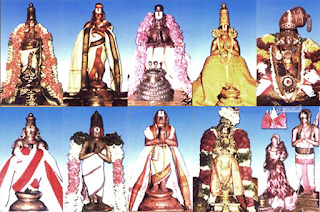 3. chakkaravarththi thirumagan avathariththa pinbu vAnarajAthi vIRupeRRAp pOlE kANum AzhwArgaL avathariththu thiryakjAthi vIRupeRRathu. சக்கரவர்த்தி திருமகன் அவதரித்த பின்பு வானரஜாதி வீறுபெற்றாப் போலே காணும் ஆழ்வார்கள் அவதரித்து திர்யக்ஜாதி வீறுபெற்றது. 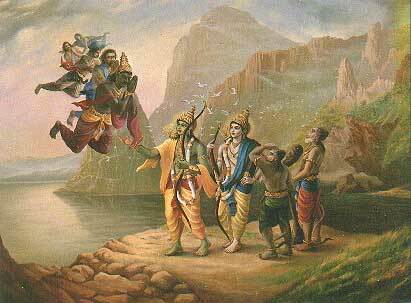 After the appearance of srI rAma (who is the son of dasaratha chakkaravarthi), the monkeys acquired fame (since they got the association of srI rAma and helped him during the battle). Similarly, after the appearance of AzhwArs, birds acquired fame - since they were requested to be messengers by AzhwArs to go and inform to bhagavAn about their sufferings in separation. 4. gatakarudaiya Athma guNaththOpAdhi rUpa guNamum udhdhEsyam. கடகருடைய ஆத்ம குணத்தோபாதி ரூப குணமும் உத்தேச்யம். 5. Iswaran Asritha sparsamuLLa dhravyaththAlallathu dhariyAn. ஈச்வரன் ஆச்ரித ஸ்பர்சமுள்ள த்ரவ்யத்தாலல்லது தரியான். bhagavAn (who is abode and controller of everything) cannot sustain himself without the objects that are related to his devotees. Translator's note: For example, krishNa longed for butter since they were hand-made by the cow-herd girls who are very attached to him. 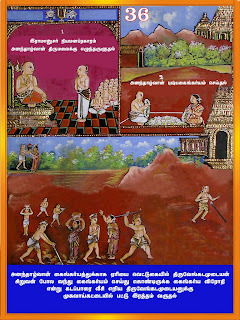 6. yOgyanukku ayOgyathai sampAdhikka vENdA; ayOgyanukku yOgyathai sampAdhikka vENdA; AgaiyAl IswarOpAyam sarvAdhikAram. யோக்யனுக்கு அயோக்யதை ஸம்பாதிக்க வேண்டா; அயோக்யனுக்கு யோக்யதை ஸம்பாதிக்க வேண்டா; ஆகையால் ஈச்வரோபாயம் ஸர்வாதிகாரம். One who is qualified need not give up his qualification to approach emperumAn; One who is not qualified need not earn qualification to approach emperumAn; So, Iswaran as the only refuge is common for every one and every one naturally is privileged to surrender to bhagavAn. 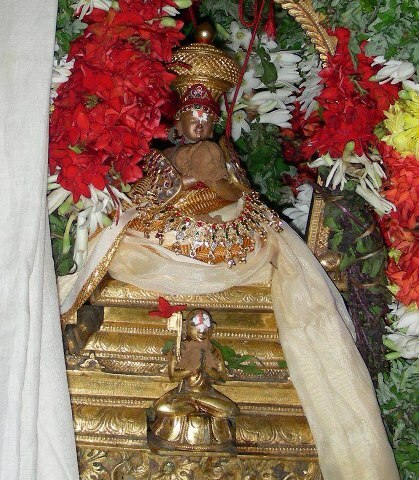 7. nAm AzhwArai anubavikkumpOthu cheruppu vaiththuth thiruvadi thozhappukkAppOlE pOgavoNNAthu. நாம் ஆழ்வாரை அனுபவிக்கும்போது செருப்பு வைத்துத் திருவடி தொழப்புக்காப்போலே போகவொண்ணாது. When one person went into the temple, he left his chappals/shoes outside. But even while worshipping emperumAn, he was constantly worried about the safety of his chappals. This is not beneficial. Similarly, when we worship AzhwAr, we should have our full focus on AzhwAr only and should not be thinking about other sensual pleasures or materialistic aspirations. 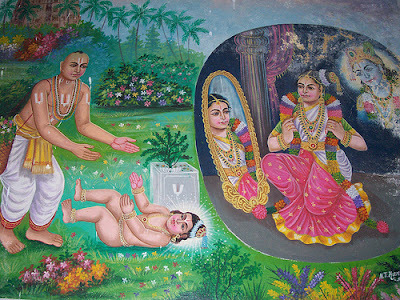 8. avan viduvathu budhdhi pUrvam prAthikUlyam paNNinArai; kaikkoLLugaikku mithra bAvamE amaiyum. அவன் விடுவது புத்தி பூர்வம் ப்ராதிகூல்யம் பண்ணினாரை; கைக்கொள்ளுகைக்கு மித்ர பாவமே அமையும். bhagavAn gives up (and punishes too) the ones who intentionally acts against the desires of bhagavAn. But he accepts and blesses the ones who even pretend as a friend. 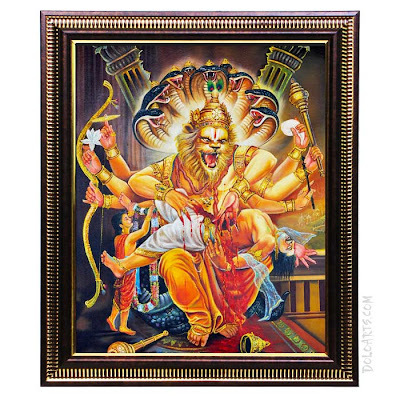 Translator's note: It is explained by the pUrvAchAryas that, even while killing hiraNya kasipu, narasimha bhagavAn checks his heart to see if there is any good intention at all but finds all hatred. sIthA pirAtti instructs rAvaNa to become a friend of srI rAma to be forgiven (she says rAvaNa need not even surrender to srI rAma, he can just show some friendship towards him to be forgiven and accepted). 9. 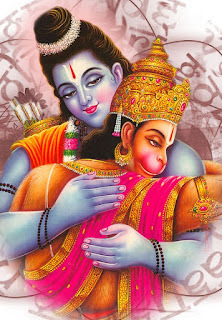 AsritharilE oruvanukkuch cheythathum thanakkuch cheythathAga ninaiththirAthapOthu bhagavath sambandhamillai. ஆச்ரிதரிலே ஒருவனுக்குச் செய்ததும் தனக்குச் செய்ததாக நினைத்திராதபோது பகவத் ஸம்பந்தமில்லை. When a srIvaishNava is done a favour by bhagavAn, if we feel happy and cherish that as if bhagavAn helped us, that indicates that we have truly understood our true relationship with bhagavAn. If we dont feel happy for the other person, that means we have not truly understood our relationship with bhagavAn who is the master of every one. 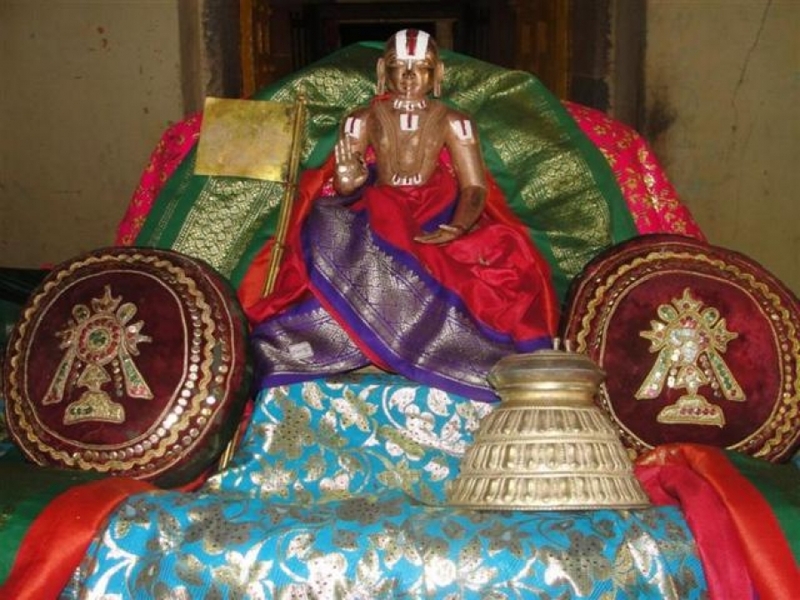 10. ammi thuNaiyAga ARizhigaiyiRE, ivanai vittu upAyAntharaththaip paRRugai. அம்மி துணையாக ஆறிழிகையிறே, இவனை விட்டு உபாயாந்தரத்தைப் பற்றுகை. ammi - grinding stone (heavy). Instead of accepting srIman nArAyaNan as the total refuge, accepting other upAyams (karma, gyAnam, bhakthi, etc) to achieve him is like jumping into a river with a heavy stone tied to us - the stone will drown into the river and will pull us along as well (suicidal). 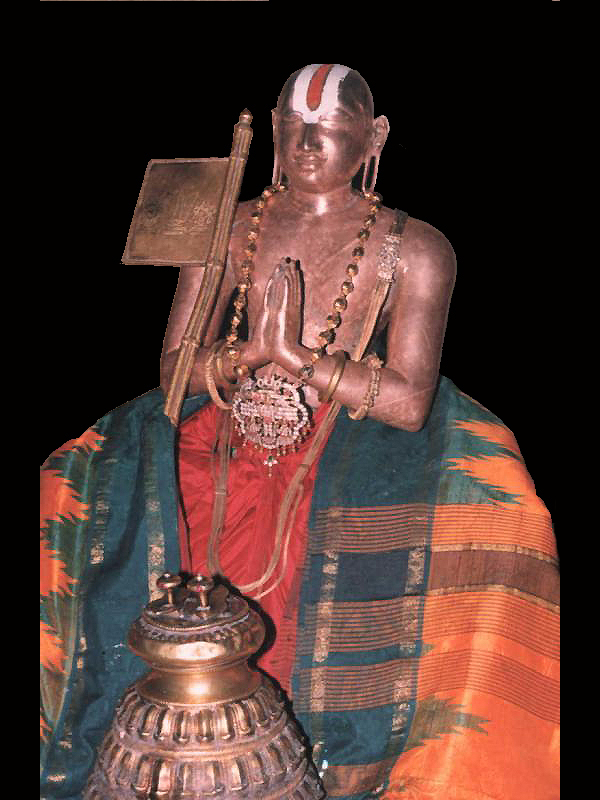 In the previous article (http://ponnadi.blogspot.in/2013/07/anthimopaya-nishtai-17.html), we observed the glories of srIvaishNavas through the words of emperumAn, pirAtti, AzhwArs and AchAryas. We also observed the unconditional kindness shown by sIthA pirAtti and mAmunigaL towards the ones who troubled them. We will now see the concluding section of this divine grantham. Please note that there are many more such noble souls who are surrendered to our pUrvAchAryas. There are many srIvaishNavas with such great AchArya nishtai at the lotus feet of our jIyar (mAmunigaL). Even today (in the times of paravasthu pattarpirAn jIyar) we can observe these amongst the relationships where both AchAryas and sishyas are fully qualified. Even in the future, as long as rAmAnuja sidhAntham is blossoming, as said in "kaliyum kedum kaNdu koNmin" (கலியும் கெடும் கண்டு கொண்மின் - ill-effects of kali will be destroyed), there will be qualified personalities forever. For such personalities, even if they casually speak some words, those will become most auspicious. 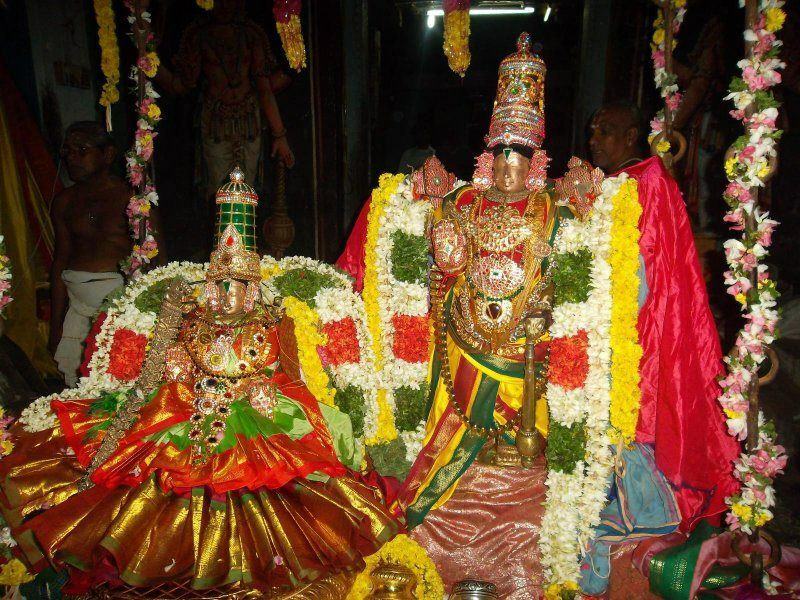 All their divine words will reveal the meanings of thirumanthram which is the essence of all of vEdhAntham. Simple translation: What is said even playfully by the twice born, who are reposed in the principles of the Vedic scriptures and are experts in disseminating the knowledge of the same, becomes the righteous and exalted opinion. Simple translation: Not only the teachings of noble men, but also their actions are to be studied carefully. (This is because) What constitutes their personal discipline is verily the purport of the scriptures. Simple translation: Those who are attached to the lotus feet of husband of srI mahAlakshmi, their words are as good as vEdham itself, their life is the source for manu smruthi and their vision is the destroyer of all the sins. 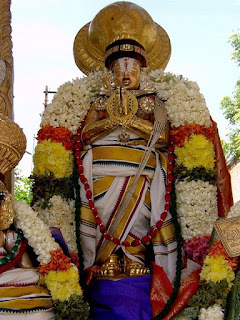 Since such devotees are known to not speak anything useless even forgetfully, all their divine words will reflect the meanings of thirumanthram which is the essence of all of vEdhAntham. As said in the following slOkam, thirumanthram contains all the essential principles of all pramANams and all that is to be known. Simple translation: The meanings of rig, yajur, sAma, atharvaNa vEdhams, vEdhAntham, ithihAsams, purANams, smruthis, etc., are all contained in this ashtAkshara mahAmanthram. yEnaiva guruNA yasya nyAsavidhyA pradhIyathE; thasya vaikuNtadhugdhAbdhi dhvArakAs sarva Eva sa: (யேநைவ குருணா யஸ்ய ந்யாஸவித்யா ப்ரதீயதே; தஸ்ய வைகுண்டதுக்தாப்தி த்வாரகாஸ் ஸர்வ ஏவ ஸ:) - Wherever that AchAryan who imbibed the knowledge about sharaNAgathi lives, for the sishya, that place itself is srIvaikuntam, kshIrAbdhi and all other divine abodes of bhagavAn. gyAna sAram 36 - villAr maNi kozhikkum vEngadap poR kunRu mudhal sollAr pozhil sUzh thiruppathigaL ellAm maruLAm iruLOda maththagaththuth than thAL aruLAlE vaiththa avar (வில்லார் மணி கொழிக்கும் வேங்கடப் பொற் குன்று முதல் சொல்லார் பொழில் சூழ் திருப்பதிகள் எல்லாம் மருளாம் இருளோட மத்தகத்துத் தன் தாள் அருளாலே வைத்த அவர்) - For a true sishyan, all residing places of bhagavAn starting with thiruvEnkatam (and also paramapadham, kshIrAbdhi, etc) are to be seen in his own AchAryan who removed the ignorance of the sishyan by his causeless mercy. 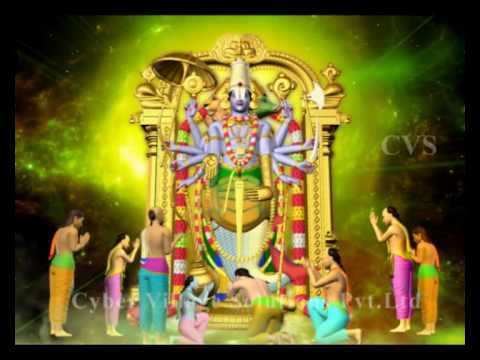 yathirAja vimsathi 4 - nithyam yathIndhra thava dhivya vapusmruthaumE saktham manObavathu vAk guNakIrthanEsau; kruthyancha dhAsyakaraNanthu karadhvayasya vruththyantharEsthu vimukam karaNa thrayam cha (நித்யம் யதீந்த்ர தவ திவ்ய வபுஸ்ம்ருதௌமே ஸக்தம் மநோபவது வாக் குணகீர்தநேஸௌ; க்ருத்யஞ்ச தாஸ்யகரணந்து கரத்வயஸ்ய வ்ருத்த்யந்தரேஸ்து விமுகம் கரண த்ரயம் ச) - mAmunigaL to srI rAmAnuja - Oh yathIndhra! Let my mind be fixated on your beautiful form; let my mouth sing your name and glories; let my hands serve you; let these not think of anything else. srIvachana bhUshaNam 321 - sishyan enbathu sAdhyAnthara nivruththiyum pala sAdhana susrushaiyum (சிஷ்யன் என்பது ஸாத்யாந்தர நிவ்ருத்தியும் பல ஸாதந சுச்ருஷையும்) - True sishya means one who considers only AchAryan as the ultimate goal and performing service to AchAryan to please him always. Such adhikAris (qualified sishyas) who are fully situated in AchArya nishtai, can give up all sensual pleasures and materialistic aspirations. 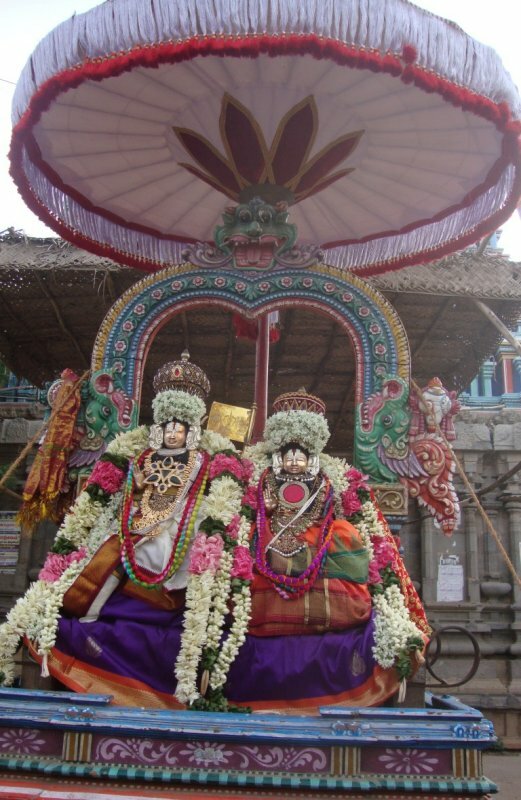 They can relish the divine auspicious form of AchAryan as said in "sadhA pasyanthi" (ஸதா பச்யந்தி - In paramapadham jIvAthmAs are blissful by constantly having the vision of bhagavAn). Further, they can serve their AchAryan in both this world and paramapadham as said in "athra parathra chApi" (அத்ர பரத்ர சாபி - sthOthra rathnam 2) along with like minded devotees in paramapadham (which is the abode of endless bliss) and be submerged in an ocean of nectarean joy and perform mangaLAsAsanam forever. We can constantly remember the following divine srIsUkthis as pramANam (valid proof) for anthimOpAya (AchArya) nishtai. periyavAchAn piLLai's divine words in mANikkamAlai - ihalOkaparalOkangaLiraNdum AchAryan thiruvadigaLE enRum, dhrushtAdhrushtangaLiraNdum avanE enRum visvasiththirukkiRathukku mElillai (இஹலோகபரலோகங்களிரண்டும் ஆசார்யன் திருவடிகளே என்றும், த்ருஷ்டாத்ருஷ்டங்களிரண்டும் அவனே என்றும் விச்வஸித்திருக்கிறதுக்கு மேலில்லை) - There is nothing higher than considering everything in this world and paramapadham as the lotus feet of AchArya and considering the visible benefits and invisible benefits as AchAryan himself. palAnubandhi - ancillary benefits such as full self realisation and living in paramapadham, etc. Simple translation: I take refuge in srI bhattanAtha muni, who saw the truths as they are by the grace of srI saumyajAmathru muni and who is the Sun of thousand rays that dispels the darkness of ignorance. Thus ends the translation of paravasthu pattarpirAn jIyar's anthimOpAya nishtai. Thus we have seen the full glories of AchArya nishtai in this concluding section. Thanks to srI ranganAthan swamy for providing translations for some samskritha pramANams.